Incubator Rocket Internet is getting into the cleaning game with its latest clone of an existing business model. Helpling is launching today in four German cities and allows users to book professional domestic cleaners for a flat rate of €12.90 ($17.80) per hour. In case you’ve not been following this space, the likes of Homejoy and Handybook (which acquired rival Exec earlier this year) have been offering ‘Uber for cleaners’ services for some time, while in the UK there’s Hassle and Mopp. So, Helpling is another clone from Europe’s ‘clone factory’, but you can hardly say Rocket is the first to copy the model. Book a time for a cleaner to visit your home and an algorithm selects an appropriate cleaner. Once the job is done, you rate the job they did out of five stars, Uber-style. 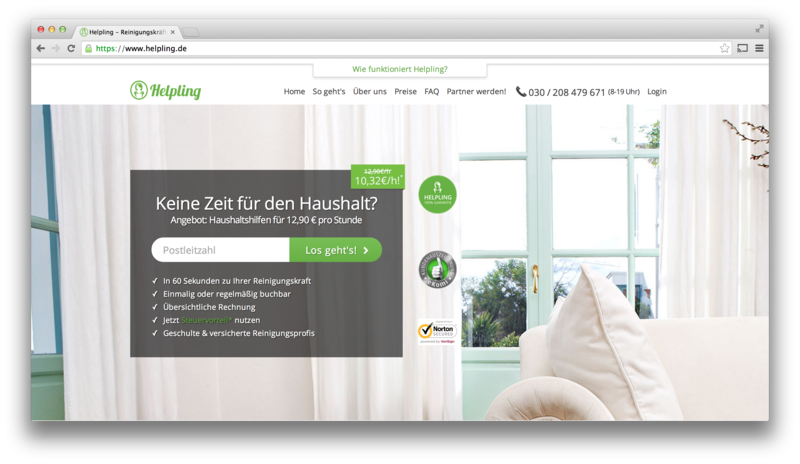 Helpling is pushing itself as an ethical and, er, ‘cleaner’ way to book a cleaner in Germany. “Around 4 million people in Germany use cleaning support on a frequent basis, but currently only 5 percent of these workers are legally licensed to carry out this work,” Rocket Internet’s announcement today notes. It adds Helpling’s cleaners are paid “fairly” and the startup only employs licensed workers. Launching today in Berlin, Munich, Cologne and Hamburg, Helpling plans to expand to all “big cities” in Germany soon. As with many of Rocket’s brands, it will also be expanding internationally, although there’s no word as to exactly where yet.